SS Vaterland was built in 1913 by Blohm & Voss at Hamburg, Germany, as the second of a trio of very large ships of Imperator-class for the Hamburg-America Line's trans-Atlantic route. She was the largest passenger ship in the world upon her completion, superseding SS Imperator, but later being superseded in turn by the last ship of this class, SS Bismarck, later the RMS Majestic. Vaterland had made only a few trips when, in late July 1914, she arrived at New York City just as World War I broke out. With a safe return to Germany rendered questionable by British dominance of the seas, she was laid up at her Hoboken, NJ, terminal and remained immobile for nearly three years when she was seized when the United States entered World War I, 6 April 1917. German crew was sent to a new internment camp in Hot Springs, NC, where many of the crew later died of a typhoid fever outbreak in summer 1918. During war Leviathan mage regular passages between the U.S. and European Allies, delivering up to 14,000 persons on each trip. On 29 September 1918 she left New York for Brest, she was one of the main carriers of troops to France, carrying 2,000 crew, and 9,000 troops. The voyage would prove to have the worst in-transit casualties of the deadly second wave of the Spanish flu. By the time she arrived at Brest on 8 October, 2,000 were sick, and 80 had died. After the war, she was at her Hoboken pier until April 1922, until finally sailed to Newport News Shipbuilding & Dry Dock Company in Newport News, Virginia. After 14-month reconditioning and refurbishment virtually a new ship emerged and she had become the world's largest and fastest ship. A claim that was immediately challenged by the Cunard Line who reminded them their RMS Mauretania (1906) still held the official speed record for trans-Atlantic crossing, as well as the White Star Line, who claimed the RMS Majestic as the world's largest ship as its length was longer, and its gross tonnage was higher as Gibbs used a skewed formula. She immediately proved popular with the American public in the 20s, starting her career fully booked for her maiden voyage 4 July 1923. Her passenger average reached a strong 1,300 by 1926, making her the #1 traveled ship on the Atlantic, but given her capacity of 3,000, it was too little to be profitable. From 1920 all US registered ships counted as an extension of US territory, making them "dry ships" according to the National Prohibition Act. 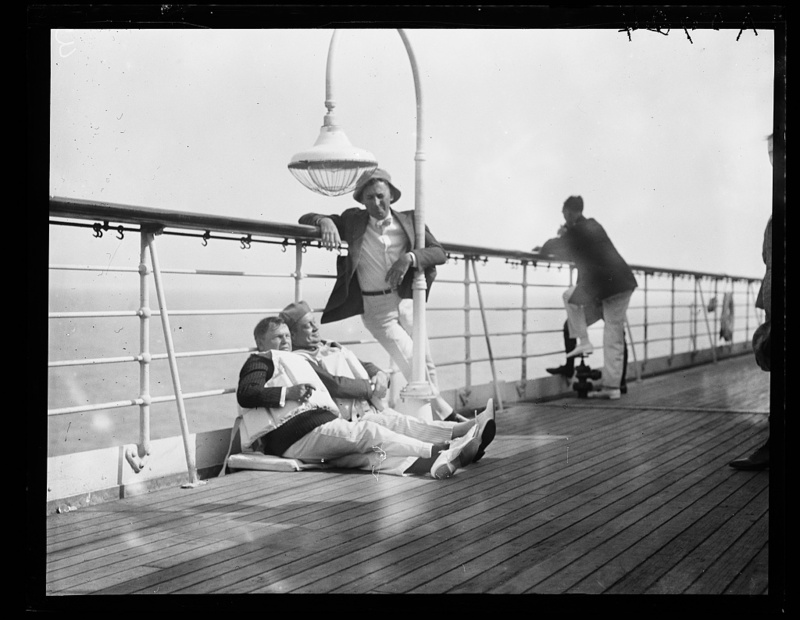 With the Atlantic shipping capacity oversaturated, especially after the Immigration Act of 1924, alcohol-seeking passengers readily chose other liners. After losing hundreds of thousands of dollars every year of service, in 1937 she was finally sold to the British Metal Industries Ltd. She arrived at Rosyth, Scotland, on 14 February. In the 13 years that she served U.S. Lines she carried more than a quarter-million passengers, never earning a cent. Leviathan was an American symbol of power and prestige, which despite her economic failings, made her a popular ship with loyal travelers. She attracted attention as the largest and fastest ship in the American merchant marine and featured in countless advertisements. The ship's orchestra, the SS Leviathan Orchestra under the direction of Nelson Maples, was also well regarded. Gramophone records were produced in 1923 and 1924 for Victor Records by the band, which would later become an inspiration for the New Leviathan Oriental Fox-Trot Orchestra decades later. General Pershing leaves the LEVIATHAN at N.Y.
Capt. Herbert Hartley in the command of a giant liner "Leviathan" at Navy Dept.